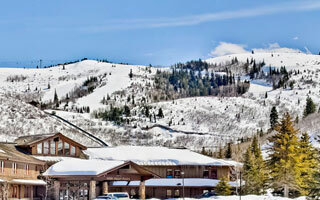 This seven bedroom home is located in the Solamere neighborhood of lower Deer Valley Resort. The home features a private outdoor hot tub, fully equipped kitchen, spacious living room with stone fireplaces, an attached garage and a beautiful mountian view. The Signature Collection's complimentary in-town transportation, provided by Cadillac, is offered during the ski season as well as the skier shuttle to and from Snow Park Lodge. Home is located in the Solamere neighborhood of Deer Valley Resort's Snow Park area and offers vaulted ceilings, large family dining area, full kitchen, fireplace, washer and dryer and private hot tub.